This level has medium difficulty. 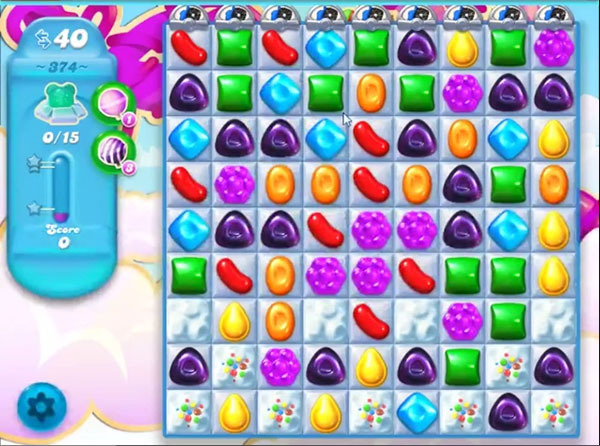 For this level try to play from bottom to shuffle candies everywhere and try to make special candy or make special candy of purple candy to get four special candy to break more blockers to find the bears. I have defeated level 373 twice played level 374 a couple of times then can’t get back in because of unlocks for lower levels. Any ideas? I’ve tried playing from the bottom, but it’s not always easy to do. I’ve been able to get 14 of the silly bears, but not the last one. But I’m sure one of these days I will. Hopefully.